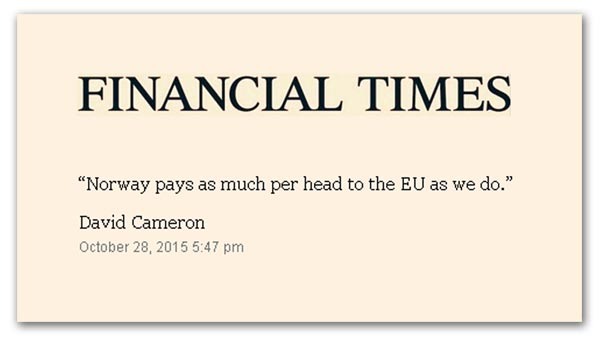 Just Why Do David Cameron His Predecessors & Allies Lie About The EU? Just Why Do David Cameron His Predecessors & Allies Lie About The EU?. one wonders why politicians of apparent stature like Heath, Kinnock, Callaghan, Major, Blair, Brown, Mandelson, and other similar scoundrels, so regularly lie about the EU in its various guises and name changes when they have very clearly been elected to represent, lead and protect Britain and our peoples! That the media in its various guises be that broadcast, TV and even the utterly irresponsible legacy media by way of the press give publicity to the lies without judgement or checking the facts – dazzled by the notoriety of the subjects whom they quote without question. I incline to the opinion that this is not a simple matter of institutional bias but more a matter of the culture that has been built by the misunderstanding and sloppy approach to journalism, compounded by the dangerous principle in many institutions of perpetuating problems by recruitment of ‘people like us’ who will not rock the boat or risk showing up the inadequacies of their colleagues. Particularly those colleagues who have feathered their own nests by building around themselves weak and adulent sycophants, enhancing their own stature and creating themselves as pundits and icons to be worshipped – be they Dimbleby, Attenborough or one of the other ‘Slebs’ created by the institutions. It does seem to be some sort of pernicious viral madness that is near hereditary by office! There is something very odd about the grip the EU has on British politics, not least in suspending the normal rules that inhibit our politicians from uttering direct lies. Thus we find David Cameron, our prime minister, weighing in on his first major intervention in the EU referendum campaign, to tell usthat the “Norway option” won’t work for Britain. With the propaganda at full tilt, he declared that, “it is very important in this debate that we are clear about the consequences” of being, like Norway, a member of the European Economic Area but not a part of the EU, then adding: “Norway pays as much per head to the EU as we do”. This was picked up by the Financial Times and other newspapers, each time in quotes, so there is little doubt that this is a verbatim quote – especially as the very words came from Mr Cameron’s lips onNewsnight. With a population of 64 million, that puts our gross contribution (without rebate) at £300 per head, our equivalent gross payment at £223 per head, and our net per capita payment £153 per annum – more than twice the Norwegian payments. As such, what David Cameron is telling us is a lie. Our prime minister is telling a clear, direct and unequivocal lie. And this, it seems, is perfectly acceptable for a prime minister – as long as he is talking about the EU. Compounding the lie, Cameron then went on to utter the fatuous slogan, “while they pay, they have no say” (on the rules), thereby ignoring the huge skein of consultation and the influence of Norway on global bodies. But just as the Prime Minister is doing his best to dissuade us from following the Norway route, and lying through his teeth in the process, we find supposedly anti-membership campaigners like John Redwood actually agreeing with him. Alongside Redwood stands Douglas Carswell, Dominic Cummings of Vote Leave Ltd and Ruth Lea whoblithely told British Influence that “we all agree”. Norway, she said, “is not the way. The way is WTO + FTAs + EFTA”. Stephen Pollard of the Daily Express also chips in to tell us that, “No one wants the so-called ‘Norway option’ and Great Britain is not Norway”. The arrogance of these people in deciding that they are qualified to represent us is matched only by their complete inability to agree amongst themselves as to what they actually want. We hear so many calls for “unity” but, in fact, there is nothing to unify with – just a mish-mash of vague, unrealisable aspirations. Thus, we have the extraordinary situation where they only unity, for the moment, is between the “remains” and the “leaver” aristocracy. Each for their own reasons, both have set their faces against the Norway Option, the latter walking away from the most powerful and credible answer to the problem of how to manage the first stage of EU withdrawal. Cummings would have us believe on the basis of unpublished poll results, that the Norway Option is “toxic” because of the “no influence” meme, neglecting to test the concept of an interim option to buy us time to pursue a better long-term solution. What they have done, therefore, is walked eyes wide-shut into an elaborate trap. The effect of David Cameron’s intervention is to get the high profile leavers to vacate the high, fortified ground, and enter onto the swampy plain of free trade agreements, where they will not be able to deliver. Out in the open, bogged down in the swamp, they will be slaughtered. Completely lost has been the opportunity to promote the idea of an interim solution, and the chance to tackle the “no influence” meme by exploring the role of globalisation that Norway has been so adept at exploiting and which could serve us so well. This, though, was our first real test. If the response is a measure of the campaign is going shape up once the pressure is really on, we might as well pack up now and save our money (those that have any). That won’t happen, of course, but I would not rule out there being a point at which the “leave” campaign is so obviously ramshackle that we will have to walk away from it. Against that negative note, we have to commend the Twitter operation, which kept the flag flying, and some superb blogging, which has filled the gap left by the increasingly crass legacy media. There, amid the gloom, quite possibly lies our salvation – our release from the deadly grip of “Europe”. Next Next post: GP > RN – A New, Updated, Better Negotiated ‘Norway Option’ Is The Way To Leave_The_EU.